1. You are an ABSN student, aren't you? What made you change your career path and choose to become a nurse? Yes, I am an ABSN student. My first degree was in Art. I worked in the fashion industry for 7 years for Levi’s. I used to style and dress the mannequins for window displays. I have always loved fashion and art. I changed my career path after I was involved in a bad accident when I fell from a four-story rooftop. I broke multiple bones and was hospitalized for two months undergoing multiple surgeries on my foot, ankle, legs, hips and spine and 8 months of extensive physical therapy. My recovery brought out feelings of extreme vulnerability and fear. Through the experience, I have come to develop an even deeper appreciation for life and am forever grateful for all the excellent care I received from doctors and nurses during my hospitalization. My experience as a patient allowed me to know first-hand the impact a great nurse can have on their patients, inspiring me to pursue nursing again so that I can be present for my patients in the same way. Once I was able to walk again, I attended classes for two years to complete my prerequisite classes. In 2016, I was accepted to Samuel Merritt University’s ABSN program, and I graduated about a week before my trip to Japan. 2．What is the area of your interest in nursing? And why? I am interested in orthopedics nursing or a nurse in the operating room. I am interested in these areas because while I was a patient in the hospital I was hospitalized in an orthopedic unit and I underwent so many surgeries. 3. What did you enjoy/learn most during the study program? And why? During the study program in Japan, I was amazed to learn about how much better the healthcare for the elderly is in Japan than in the United States. I admire the fact that there is long-term care insurance, and that people really take care of one another. It is amazing to me that virtually everyone can afford healthcare. I am so impressed to learn that nurses can regularly visit the home, help with daily medication, and bathing assistance. I was very close to my Grandmother, who passed away while I was in the ABSN program. During her last years of life, she had to pay so much of her own money just to get the healthcare, equipment, and services that she needed to stay alive. If the United States had a healthcare system more like Japan’s I believe my Grandmother’s last years of life would have been less financially stressful for her, and more importantly, her years and quality of life may have been extended as well. My two most enjoyable experiences were the home visit and also my stay with my host, Yuki. We had such an amazing time together and she was so kind. Despite the language barrier we were able to connect and became close friends quickly. I am very grateful to have had the opportunity to meet and spend time with her. 4. What surprised you most during the stay in Japan or Hamamatsu? I was most surprised by how clean everything is in public (buses, trains, streets, etc.) and also how difficult it is to find a garbage can to throw away your trash. I was also surprised by how nice, polite, and welcoming everyone was. 5. What do you recommend we do when we visit your place? San Francisco is also home to the California Academy of Science- the only place on the planet with an aquarium, a planetarium, a natural history museum, and a four-story rainforest all under one roof. It is best to go Thursday evenings for “Nightlife” where visitors explore a unique theme each week and after-hours access to all academy exhibits. The Golden Gate Bridge spans 2.7-kilomerers. I have only walked it once, but if you come visit, I would love to walk it with any of you. :-) The Golden Gate Bridge is said to be one of the most photographed landmarks on Earth. Fisherman’s Warf is also home to Pier 39, a waterfront marketplace that is one of the city’s most popular attractions. A community of California sea lions has decided to make Pier 39 their home. From there it’s a short walk to Ripley’s Believe It or Not, arcades, restaurants, street performers, and crab vendors selling fresh crab and shrimp cocktails. Cable cars have been transporting people around San Francisco since the late 19th century. The cars run on tracks and are moved by an underground cable on three routes. Their familiar bells can be heard ringing from blocks away. Each one-way ride will provide beautiful views of the city’s hills and can also transport you from downtown SF to fisherman’s Warf and Back. I have ridden the cable cars many times. Union Square is the place to go if you are into shopping or fashion. Major department stores and designer boutiques line streets like Post, Sutter, Geary, Grant, Stockton and Powell. The Westfield shopping center is a huge mall with plenty of shops as well. This is where I used to work in Fashion, so if you come, I would love to show you around. Alcatraz, a former prison, is located on an island of the same name in the middle of San Francisco Bay. Some of the United States’ most notorious criminals were incarcerated there. A visit to Alcatraz today is fascinating. Cell-house tours are available, allowing visitors to learn about the prison as they explore the buildings and grounds. I have gone here once, on a night tour, and it was very interesting and exciting. They take a boat out at night to the island and it is dark and spooky. Let me know if you make it to San Francisco. I would love to show you guys around! I enjoy spending time with my family and friends. I also enjoy making crafts, painting, and sewing. I am forever grateful for the friends and memories I made on this trip. I learned so much and was able to understand things from a broader perspective and I feel that I will become a better nurse because of my trip to Japan and to your school. 8. Can you give a message to SCU students or future ones? If given the opportunity I would recommend coming to the United States and visiting Samuel Merritt University. Traveling abroad has been such an amazing experience for me. I would also recommend you explore San Francisco and some of the things to do that I mentioned above. This experience I had in Japan has meant so much to me and has been the best trip of my life. So please, come visit and do the exchange program like I did! 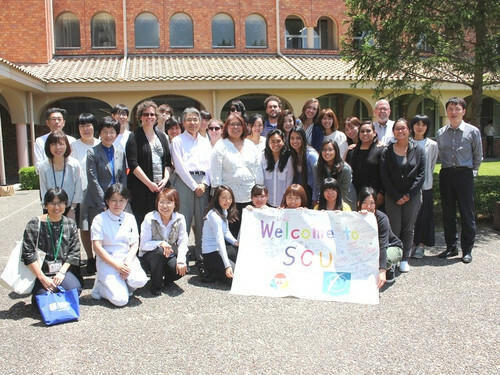 "To start off I would like to thank all of the students and faculty at Seirei Christopher University who welcomed us and guided us on our journey of learning about the healthcare system in Japan. Thank you so much for your guidance and hospitality! (1) I originally studied Human Physiology in my 4-year undergraduate degree. I knew I wanted to pursue a career in healthcare but was not sure what specific area I wanted to pursue. I initially thought I wanted to be a physical therapist, but after doing about 100 hours of observation I decided I wanted to go down a pathway that was more holistic in the sense that nursing treats the entire person rather than just a hip or a knee joint. (2) The area of nursing that I am most interested in is critical care also known as ICU. This is the area that I did my senior preceptorship clinicals in. I very much enjoy critical care because I enjoy being very invested in the care of my patient and knowing all of the complexities of their critical condition. I like that it takes a high level of critical thinking and assessment skills to be an ICU nurse and enjoy interpreting telemetry. (3) During our exchange trip at Seirei Christopher University, one of my favorite experiences was accompanying my home health nurse to visit one of her 95-year-old patients. The patient was so full of life and energy I would have thought she was about 75 years old if I hadn't known better. It was so wonderful to see an elderly patient receiving care in the comfort of their own home. Home visiting nursing is not as common here in the United States. The patient lived on a green tea farm with a factory on site to process the tea. We drank tea together and her grandson gave us a tour of the factory. Towards the end of our visit, I asked the patient what her secret was to a long happy life. She told me to eat well and to always enjoy the company of friends and family. I very much treasure this experience. (4) During my stay in Japan, one of the things that surprised me the most was how friendly and helpful everyone was that we encountered. It was wonderful to be surrounded by a culture in which respect for others is highly valued. Another thing that surprised me was how clean everything is in Japan! In the United States, we have trash cans on nearly every street corner and in every room of every building but it is still very common to see trash on the ground which can be very upsetting. (5) If you are ever to visit California I highly recommend doing some sightseeing in San Francisco. It is a beautiful city and has many famous sites to see such as the Golden Gate Bridge, the island of Alcatraz, and Pier 39. Another place that is one of my favorite spots is Lake Tahoe which is up in the Sierra Nevada mountains. In the wintertime there is snow and many people go snow skiing, and in the summer it is warm and people enjoy boating and sunbathing. Please come and visit if you ever have the opportunity! (6) In my spare time, I love doing all sorts of outdoor activities! I love going hiking, backpacking, rock climbing, and biking. I also love to do yoga, meditate and dance. I am happy that I have finished nursing school because now I have more free time to do the things I love. While I was in my program I had very little free time and was too busy to do any exercise or activities. I'm sure many of you can relate! (7) After our program 2 of my classmates and I extended our trip in Japan and visited Kyoto and Tokyo. I am so glad I had the opportunity to see more of Japan before returning home. In Kyoto, we stayed at a traditional Onsen and visited many of the temples and shrines in the city. My three favorite locations were the Kinkakuji temple, Ryozen Kannon temple, and the Fushimi Inari Shrine. In Tokyo, we went to the top of Tokyo tower, Skytree Tower and visited Takeshita street. (8) My message to SCU students is that it is so wonderful that they are interested in pursuing a career in nursing. I believe it takes a very compassionate individual to enter into this field and it is so wonderful that we have had the opportunity to exchange ideas and perspectives cross-culturally. One thing that I have walked away from the experience having learned is that even though we may perceive variation between us, we are all so much more similar than we are different."